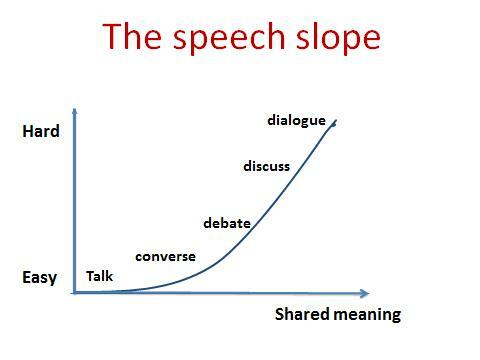 Where are you and your team on the speech slope? We are not referring to your ability to speak or string words together but to something rather deeper and more difficult to do – your ability to reach higher levels of shared meaning when it matters. Do you know which form of speech to use and when? Are you and others in the team prepared to let go of a ‘win-lose’ way of thinking, to be curious about other perspectives and to shift towards genuinely thinking together, rather than thinking individually and only talking together? Dialogue is a conversation in which people ‘think together’ in relationship. Its purpose is to go beyond any one person’s understanding. When you hold a dialogue, you are not seeking to win, but to achieve a better outcome for all concerned – dovetailing individual outcomes as you proceed. To enter into dialogue, you must be willing to park your ego and believe that you don’t necessarily have the best or right answer. You relax your grip on certainty and listen to the possibilities that result simply from being in a relationship with others. From this openness come questions that lead to a fuller understanding. You suspend your own position and welcome the conversation as a joint discovery, not a competition to win or do battle. Learning to do this means you gain the enormous benefits of different perspectives and develop a broader, richer end result. Dialogue is respectful and is a skill essential to achieving consensus decisions where there are complex issues with no easy answers. There is also risk in entering dialogue and surfacing true differences. You must be willing to take some personal risk, to increase the trust you place in those you deal with and to share more in order to reach decisions that are richer, more creative and truly owned by all involved. It is challenging work and the temptation will be to stay in discussion and defend your point of view. What is it that you see that I don’t? How do you see this differently and why? I am realising as we talk that I don’t fully understand how you see this problem. Perhaps you can help me understand from your perspective? Dialogue is also one of the most powerful and precious gifts leaders can give to their teams. If you are a leader, you can do this by devoting the time to grow dialogue skills and personally modelling them in your daily communications. We offer workshops, coaching and facilitation to guide leaders and their teams on this approach. If you would like our insight paper on this topic, to have a meeting facilitated along these lines or to develop these skills in your team. click here. 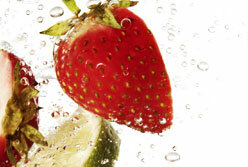 Fruitful conversations provide access to learning. The latest on what works when leading and inspiring others.